It takes a lot to serve your country, and given that the United States of America boasts one of the most patriotic residents in the world, they take a lot of pride when it comes to serving their country in all forms. One form of service that is often overlooked is the Butler. They might be overlooked because all they do is be at service for those in need, but it has always been said that they’re the people who know the most information because they really do hear everything. How this all ties into racial tension comes to the early contrast of house and field slaves (you know the other word, but I choose not to use it). The house slaves were trained to be ‘the help’ (also a good movie), and the ones in the field were known to be the rebellious type that threatened the slave owners. It’s crazy how that nature from 300 years past would have the same effect leading right up through the Civil Rights Movement long after Slavery had been abolished. So with that undertone in the movie already set, what would a Butler have anything to do with it that was so important? This is what I thought of heading into the movie. Forest Whitaker always seems to be involved with historically dramatic films, and takes full advantage of them (Producer of Fruitvale Station; won an Oscar for The Last King of Scotland) but he is a well rounded actor. Taking on the role of Cecil Gaines, a child born into slavery, the movie takes through the unlikely progression of a server who eventually made it into the White House to serve for a lot of Presidents. During that time, you see just what type of conversations that the leaders of the free world would have behind closed doors, whether it be with or without their trusty advisors to their aid. 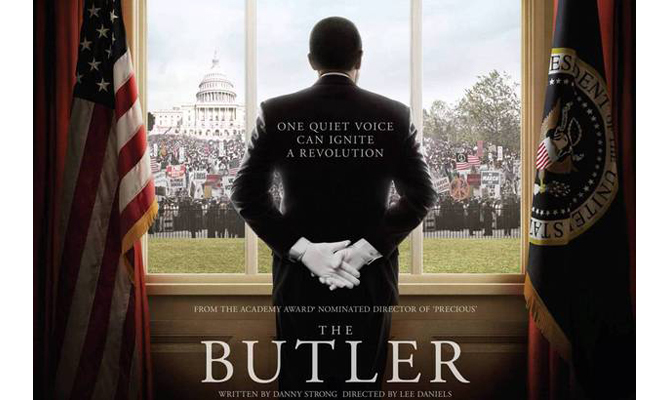 With the bulk of this movie being surrounded by the Civil Rights movement, there were a lot of key moments that helped determine some decisions all off the strength of having a Black butler to the personal aid of the President. At the same time, Cecil also dealt with his own family struggles, especially when you’re in an occupation where you work long hours in a space that contains so many world secrets that you can’t talk about. A frustrated wife (Oprah), and two children on either sides of the patriotic fence (played by David Oyelowo & Elijah Kelley), where one wanted to change the face of civil rights for African Americans, and the other wanted to fight for freedom in Vietnam. It was a revolutionary time in The United States, and the issue was, where one would be placed on the side of History – the progressive or regressive? The fact that this movie was 1 of 3 in 2013 to come out to have racial tensions portrayed in different eras of American society (12 Years a Slave & Fruitvale Station being the others), it shows you that as much as the general American public doesn’t like to address the racial issues, they’re still evident to this day and although there have been ‘some’ progression towards improving, these movies still serve as reminders to the current and future generations just where they come from. Cecil was a well respected man who came from one of the depths of hell on earth to what was the pinnacle of success for a Black man to be so close and (at times) a factor in changes made for his race in American history.